Background and objectives: Subacute sclerosing panencephalitis (SSPE) is a progressive catastrophic neurodegenerative disease because of persistent measles viral infection in the brain. This study was designed to determine the spectrum of magnetic resonance imaging (MRI) findings in subacute sclerosing panencephalitis. Methods: We described the brain MRI findings in 20 pediatric patients with confirmed SSPE with their clinical and electroencephalogram (EEG) correlates. This study was conducted at Aga Khan University Hospital, Karachi, Pakistan between January 2006 and June 2016. Diagnosis of SSPE was on the basis of the clinical signs and symptoms, the characteristic EEG patterns (burst suppression in the early stage and a diffuse, random, slow arrhythmia pattern in the late stage), and high titers of measles antibody in the cerebro-spinal fluid. Results: The mean age at presentation was 7.4 ± 3.3 years. MRI abnormalities included diffuse white matter changes (n = 8), subcortical T2 hyperintesities in both grey and white matter in 1 patient and the brainstem changes in 2 patients. MRI was normal in 8/20 patients. Magnetic resonance spectroscopy (MRS) was performed in 4 patients out of whom 1 patient showed reduced N-acetyl aspartate (NAA) peak with elevated choline peak and inverted doublet lactate peak, 1 showed only reduced NAA, 1 showed isolated choline peak and 1 patient had a normal MRS. Conclusion: MRI brain to date is supportive in understanding the pathology of SSPE. MRI can be normal in patients with SSPE if done early on at the start of the disease. Subacute sclerosing panencephalitis (SSPE) is chronic encephalitis occurring after an infection with measles virus (Jabbour et al., 1975). The most frequently involved structures of the brain are the periventricular and subcortical white matter. The parieto-occipital region of the brain is most frequently and severely affected, and the involvement is generally asymmetric. The basal ganglia, cerebellum, spinal cord and corpus callosum are less frequently involved (Bohlega and al-Kawi, 1994). Involvement of the deep nuclei has also been reported (Garg, 2008). In the advanced stage, when the patient is in a vegetative state, almost total loss of white matter occurs and the corpus callosum also becomes thinner. At this stage there is marked cerebral, cerebellar and brainstem atrophy (Alkan et al., 2006). Pakistan has one of the highest incidences of SSPE (Onal et al., 2006). The incidence of SSPE accounts for 4–11 per million children who have had measles; however, if the measles infection is acquired very early in life, the risk may be even higher, up to 18 per million children with measles (Saleem et al., 2009). Due to limited available resources in Pakistan, SSPE is underdiagnosed as kits to detect measles IgM in cerebro-spinal fluid (CSF) kits are not freely available. Therefore, the diagnosis is mainly clinical and neurophysiologic findings help support the diagnosis. There are no consistent MRI findings described in SSPE that can help in the diagnosis. We describe the MRI findings in 20 patients with confirmed SSPE with their clinical and EEG correlates. This study was conducted at Aga Khan University Hospital, Karachi, Pakistan between January 2006 and June 2016. Aga Khan University Hospital is one of the largest private tertiary care hospitals in Pakistan. The Institutional Ethics Committee approved the study protocol (approved No. 4037-Ped-ERC-16). Total of 26 patients were included from January 2006 and June 2016. 16 of these patients were the ones reported by Ibrahim et al. (2014) and 10 patients were new. Of these, 20 patients underwent MRI brain. Cases were identified by using hospital information management system using international classification of disease-10 (ICD-10) coding A81.1 for SSPE (Ibrahim et al., 2014). SSPE was diagnosed on the basis of the clinical signs and symptoms, the characteristic EEG patterns (burst suppression in the early stage and a diffuse, random, slow arrhythmia pattern in the late stage), and high titers of measles IgM antibody in the CSF. The criteria formulated by Jabbour et al. (1975) were used for clinical staging. Cranial MRI was performed on a 3.0 Tesla Vantage titan machine by Toshiba that is supplied by Medequip Pakistan. T1-weighted, T2-weighted, fluid attenuated inversion recovery, diffusion-weighted and T1-weighted with contrast sequences were obtained. The data was collected on a preformed proforma on which basic demographics, such as age, gender, ethnic background and vaccination status, history of measles, clinical presentation, lab findings and imaging features of the patients with SSPE were recorded. The interval between symptoms and MRI findings as well as between onset of symptoms and death were recorded. SPSS version 20 software (IBM, Armonk, NY, USA) was used for statistical analysis. The mean values and the standard deviation were calculated. The mean age at presentation was 7.40 ± 3.33 years. Boys were affected more than girls. History of previous measles was available in 11 of 20 patients and symptoms of SSPE appeared after a mean gap of 4.67 ± 1.83 years (range: 2.5–8 years) following measles. The mean interval between the beginning of symptoms and the diagnosis was 9.3 ± 8.0 weeks. The mean age at the time of measles infection was 0.5 ± 0.87 years. 15/20 children were immunized for measles. Thirteen patients were in stage II of Jabbour criteria and seven were in stage III at the time of evaluation at our center. Dystonia was the initial presentation in two patients. EEG was abnormal in all the patients and the abnormalities persisted both in awake and sleep records. The classic EEG finding was burst suppression which was seen in 12 patients, 6 patients had diffuse delta and theta slowing and additional focal discharges in the temporal region was seen in 2 patients. Out of the total 20 patients, the MRI abnormalities included diffuse white matter changes (n = 8), subcortical T2 hyperintesities in white matter in 1, and brainstem changes in 2 patients. One patient had abnormal T2 hyperintense signals in bilateral putamen and changes in deep white matter. Two patients had diffusion restriction; one of them having abnormal signals in bilateral putamen had diffusion restriction in right thalamus while the other who had changes in deep white matter as well as centrum semiovale had restriction in the post central gyrus. MRI was normal in eight patients. MRS was performed in four patients out of which one patient showed reduced N-acetyl aspartate (NAA) peak with elevated choline peak and inverted doublet lactate peak while one showed reduced NAA, one patient showed isolated choline peak and one patient had a normal MRS. The imaging findings of MRI scans are depicted in [Table 1] and [Figure 1]. Figure 1: Magnetic resonance imaging and magnetic resonance spectroscopy findings of a 3-year and 6-month-old boy with subacute sclerosing panencephalitis (SSPE). The patient came with complains of frequent myoclonic jerks. He had measles at 10 months of age. (A) T2 axial section: Symmetrical confluent hyperintense in white matter extending to subcortical region. Global involutional changes with prominent sulci and proportionately dilated ventricles noted. (B) Magnetic resonance spectroscopy: Reduced N-acetylaspartate (NAA) peak with elevated choline (Cho) peak. Cr: Creatine. Follow-up was done by calling the families by phone, approximately 3.10 ± 2.60 years after the initial presentation. Out of the 20 patients studied, 11 patients had expired at the time of study; 10 with respiratory complications and 1 with urosepsis. Seven were alive but had disease progression and were at stage III, while two were static at stage II. SSPE was first described by Dawson (1934) as inclusion body encephalitis. It is a global disease but affecting primarily developing countries (Jagtap et al., 2013). There has been a rise in SSPE incidence in Pakistan owing to the suboptimal routine measles immunization coverage. Pakistan comes under the category of countries with poorly controlled measles because of its continued epidemics (Ibrahim et al., 2014). Various case series have described the radiological findings in SSPE patients and their correlates with clinical and EEG findings (Oztürk et al., 2002; Praveen-Kumar et al., 2011). Age at onset in our study was 7.4 ± 3.33 years while that shown by Oztürk et al. (2002) was 12.5 ± 2.6 years. This is probably because of repeated measles epidemics in Pakistan and poor maternal immunization status leading to early measles infection (Ibrahim et al., 2014). The mean age of acquiring measles infection, in our study was 5.7 ± 8.7 months. The lowest reported age is 25 days of life giving us enough evidence to vaccinate earlier rather than later (Sawaishi et al., 1999). Several reports suggest that the average time between measles infection and subacute sclerosing panencephalitis is 7 years while we have the mean interval of 4.675 ± 1.8 years (Jagtap et al., 2013). Our 7 patients were in stage III while the remaining 13 were in stage II. MRI is a highly sensitive imaging modality that has been used in SSPE. In our study, there was a relationship seen between the clinical stage of disease and the MRI findings as 6/13 (54%) in stage II while 5/7 (71%) of stage III had abnormal MRI findings. A similar relation was depicted by Cece et al. in 2011 that showed in their study that 60% stage I/II SSPE patients while 93% stage III/IV patients had abnormal MRI brain findings (Cece et al., 2011). Prior studies have shown that the most common areas involved are the cerebral cortex, i.e. periventricular and subcortical regions. Regions less involved include the basal ganglia, cerebellum, spinal cord, corpus callosum and brainstem (Oguz et al., 2007). Forty percent of our patients showed diffuse white matter changes while this finding was present in 65% patients as reported by Praveen et al. Brainstem changes were present in 10% of our patients while this was seen in 4.3% of patients by Praveen et al. Cerebral atrophy was present in only one patient (5%) while this was present in 5/23 (21.7%) and 3/33 (9%) patients in the series reported by Praveen-Kumar et al. (2011) and Oztürk et al. (2002) respectively. Alkan et al. (2003) reported decreased NAA and increased choline and myo-inositol peaks in stage 3 of SSPE, reflecting neuronal loss, glial proliferation and inflammation respectively. In summary, SSPE is a devastating illness with great morbidity and mortality. A relationship was seen between the clinical stage and the MRI findings but we were unable to establish different MRI findings with each stage and few patients were found to have normal MRI as well. Alkan A, Sarac K, Kutlu R, Yakinci C, Sigirci A, Aslan M, Baysal T (2003) Early- and late-state subacute sclerosing panencephalitis: chemical shift imaging and single-voxel MR spectroscopy. AJNR Am J Neuroradiol 24:501-506. Alkan A, Korkmaz L, Sigirci A, Kutlu R, Yakinci C, Erdem G, Yologlu S (2006) Subacute sclerosing panencephalitis: relationship between clinical stage and diffusion-weighted imaging findings. J Magn Reson Imaging 23:267-272. Bohlega S, al-Kawi MZ (1994) Subacute sclerosing panencephalitis. Imaging and clinical correlation. J Neuroimaging 4:71-76. 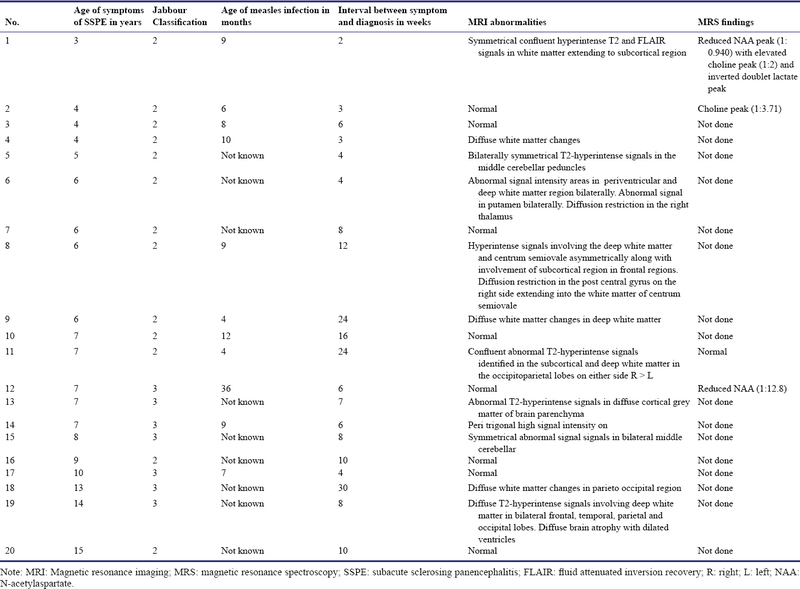 Cece H, Tokay L, Yildiz S, Karakas O, Karakas E, Iscan A (2011) Epidemiological findings and clinical and magnetic resonance presentations in subacute sclerosing panencephalitis. J Int Med Res 39:594-602. Dawson JR (1934) Cellular inclusions in cerebral lesions of epidemic encephalitis: second report. Arch Neurol Psych 31:685-700. Garg RK (2008) Subacute sclerosing panencephalitis. J Neurol 255:1861-1871. Ibrahim SH, Amjad N, Saleem AF, Chand P, Rafique A, Humayun KN (2014) The upsurge of SSPE--a reflection of national measles immunization status in Pakistan. J Trop Pediatr 60:449-453. Jabbour J, Duenas D, Modlin J (1975) SSPE-Clinical staging, course, and frequency, 1975. Arch Neurol 32:493-494. Jagtap SA, Nair MD, Kambale HJ (2013) Subacute sclerosing panencephalitis: A clinical appraisal. Ann Indian Acad Neurol 16:631-633. Oguz KK, Celebi A, Anlar B (2007) MR imaging, diffusion-weighted imaging and MR spectroscopy findings in acute rapidly progressive subacute sclerosing panencephalitis. Brain Dev 29:306-311. Onal AE, Gurses C, Direskeneli GS, Yilmaz G, Demirbilek V, Yentur SP, Ozel S, Yapici Z, Tumerdem Y, Gökyigit A (2006) Subacute sclerosing panencephalitis surveillance study in Istanbul. Brain Dev 28:183-189. Oztürk A, Gürses C, Baykan B, Gökyigit A, Eraksoy M (2002) Subacute sclerosing panencephalitis: clinical and magnetic resonance imaging evaluation of 36 patients. J Child Neurol 17:25-29. Praveen-Kumar S, Sinha S, Taly AB, Bharath RD, Bindu PS, Murthy SS, Ravi V (2011) The spectrum of MRI findings in subacute sclerosing panencephalitis with clinical and EEG correlates. J Pediatr Neurol 9:177-185. Saleem AF, Zaidi A, Ahmed A, Warraich H, Mir F (2009) Measles in children younger than 9 months in Pakistan. Indian Pediatr 46:1009-1012. Sawaishi Y, Abe T, Yano T, Ishikawa K, Takada G (1999) SSPE following neonatal measles infection. Pediatr Neurol 20:63-65. SKJ participated in conception, design, data collection, manuscript writing; YH carried on MRI reviews, manuscript writing, critical revision; KA took part in intellectual input, final approval of the manuscript; SHI conducted conception, design, manuscript writing, final approval of the manuscript. The protocols had been approved by the Institutional Ethics Committee approved the study protocol (4037-Ped-ERC-16).